On the 18th of August 2018, Han Chiang High School held its annual Entrance Exam for the intake of new students for 2019. With approximately 500 students attending, the examination was held in the school hall and a few classrooms in the Just English Centre. 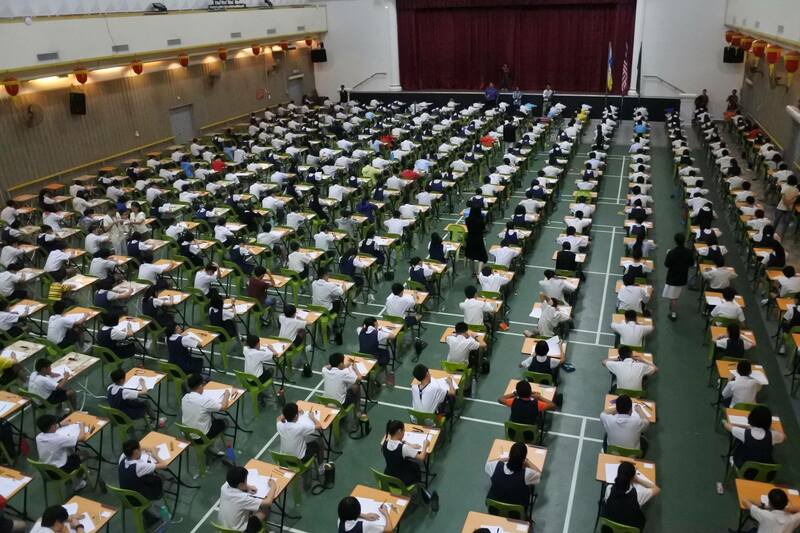 Students taking the examination in the hall were signed up for IGCSE and UEC English courses, while those at the English Centre were those who plan to enrol for the UEC Chinese course. All candidates took exams for the four fundamental subjects: Chinese, English, Science and Mathematics. The day began early at 7:30 a.m, with parents registering their students followed by prefects leading the registered students to their respective classes. A briefing of examination rules for the students was held in the hall, shortly before the Chinese and Elementary Chinese exam began until 9:10 am, by which the students had their first break. The 10 minute break flew past, with students returning to their respective exam venue to start their English exams, which ended at 10:50 a.m.
After that, the students were led to the canteen in an orderly manner for their lunch break. The break was a brief reunion for both parents and students, each with something to share, about the examination or the school. After their break, the students proceeded with their Science and Mathematics examinations, each lasting 40 minutes. The exam finally ended at 12.50 p.m.
Concurrently with the examination, an information session conducted by the principal of Han Chiang High School, Madam Kung Bee Lee, was held in the MPH at 8:15 a.m. In this session, Madam Kung introduced the courses and facilities that Han Chiang High School has to offer, and the examination levels for each course. The MPH however, was not only lined up with chairs, but also with students’ art masterpieces proudly on display. On a corner of the MPH were tables filled of textbooks of different courses, with teachers to tend helpfully to parents’ inquiries. An introduction to the World Scholar’s Cup (WSC) was then presented by Mr. Samuel Ong, in which videos and photos of previous rounds of the programme were shown. The numerous trophies won by Han Chiang’s students were also exhibited in the English Centre, with a variety of Cambridge English textbooks that were open for parents to take a look. During that time, parents were given a chance to explore the school, with teachers taking them on a tour around Han Chiang’s facilities, such as the hostel, library, English Centre and stadium, whilst giving explanations along the way. Parent Mrs Sim revealed that she had chosen Han Chiang thanks to her friend, who has a child currently studying here, so she considered giving the school a try. She also added that she has a nice first impression of the school, as the helpful prefects made the registration process smooth and brief. Another parent Mrs Yeoh, who hails from America, settled for Han Chiang due to the fact that school emphasises the use of English. The UEC English course is her choice, as she wanted her child to not only improve his or her English, but also to enhance their fluency in Chinese.